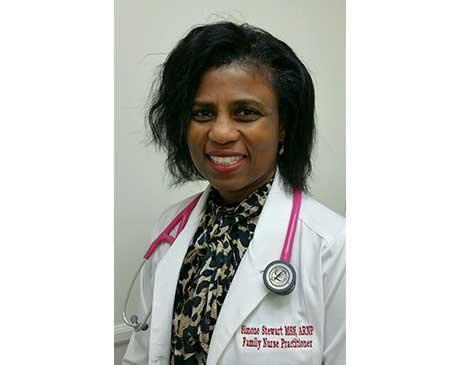 Simone Stewart is a highly skilled Board-Certified Family Nurse Practitioner. Simone has excelled academically with a BSN in nursing and a Master's of Science in Nursing from the Family Nurse Practitioner Program at Kaplan University. Her passion for serving started at the early age of 17 when she enlisted in the United States Army and became a medic and a paratrooper. In addition to her twenty years of experience as a Labor and Delivery nurse, she brings her diversified body of knowledge in the areas of Infectious disease, Oncology, Emergency, and Critical Care to Total Women's Healthcare. Her passion for quality patient centered care, her love for the process of childbirth, and her excellent academic and clinical success has earned her the respect and admiration of her patients, peers, and co-workers. Simone’s charismatic personality, outstanding clinical reasoning skills, and her passion for optimizing the wellness of her patients has built strong partnerships to meet their health care goals and needs. Simone’s high-quality patient care stems from her philosophy of treating each patient as if they were a precious member of her own family.